Passionate green thumbs never know what they might unearth in the garden collection at Collections Etc. Our team is staffed by many serious and hobby growers, so we know just how important it is to have all the right lawn and garden accessories in the shed for year-round use. We offer everything from truly unique garden novelties, such as clever but affordable garden edging, to smart garden tools that will make you ask, “Why didn’t I think of that?” It’s all about helping you beautify your landscape, but also simplifying (and enjoying) the job as you do it. Explore our overflowing bouquet of lawn accessories and garden tools if you’re looking for a remarkable gift for the gardener on your list. These products address common gardening drawbacks, like sore knees from kneeling for too long and straining from reaching too high to water hanging plants. You’ll even discover brand-new As Seen on TV products that aim to de-stress notorious garden challenges as well as protective and stylish garden clothing that keeps you safe and comfortable while you’re digging, weeding and planting for hours on end. 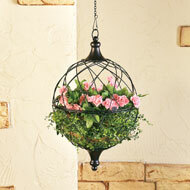 Find the perfect lawn and garden accessory to suit your specific garden or landscape theme at Collections Etc. 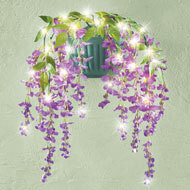 Discover a huge treasure trove of pretty, decorative planters, lights, borders and trellises that help you create an especially welcoming outdoor atmosphere. 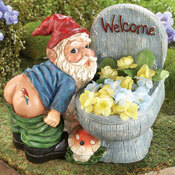 Shop adorable but functional garden products for the holidays and seasons that tell a special story. Collections Etc. always offers excellent prices and an eclectic assortment of one-of-a-kind finds, so make sure to trust us with all your garden goods and gifts throughout the year. Dress up your windows with patriotic style. 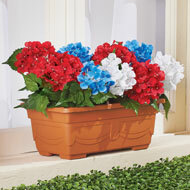 Red, white and blue hydrangea blooms are "planted" inside a terracotta colored window box that's filled with greenery. Box measures 13 1/2"L x 7 1/2"W x 14"H.